This four-story structure was completely renovated; the top three floors were converted into residence hall rooms with high ceilings, and the first floor was converted into DePaul's campus bookstore. 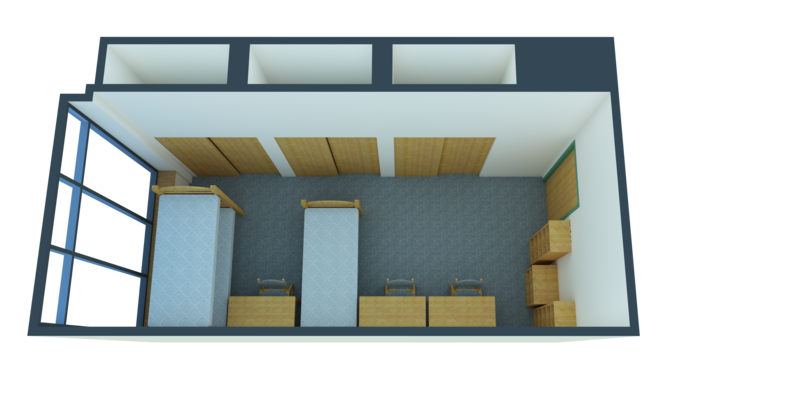 Seton Hall's residents are comfortably housed in air-conditioned double, triple and quad occupancy rooms, most of which have walk-in closets. The bathrooms on each floor offer a level of privacy uncommon for community bathrooms, with separate entrances for sinks, toilets and showers, each provided with individual stalls. Each floor has a full kitchen, lounge, laundry room and study rooms. Collaboration lounges are on the third and fourth floors. Full kitchens, lounges, laundry rooms and study rooms on each floor. Want to get a better idea of what this hall looks like? Jump right to Seton Hall on our virtual tour for a look inside the building. Seton Hall also has converted housing, in which regular double residential units are converted to triple units. 360 tours of converted housing units are not yet available for Seton Hall, but you can view a 360 tour of a lived-in converted housing unit in Clifton-Fullerton Hall, with an occupancy of three residents.